Placid Curves is a showstopper! I’ve watched a number of people flip through Modern Neutrals, and nearly every one had to stop and look at Placid Curves just a bit longer than the rest. While there are a lot of tiny squares and rectangles, there are actually not any curves – simply the illusion of such. It’s strip-pieced too – much simpler than it looks! Placid Curves measures 84″ x 96″ with fabric and block requirements for a throw size included. Expertly pieced by Audrie of Blue is Bleu! How did you ever come up with this beauty Amy? I’m going to read the pattern again and decide if I can make it. This pattern is inspired and inspiring. I love it. This quilt is truly a show stopper. It is visually stunningly wonderful!!! 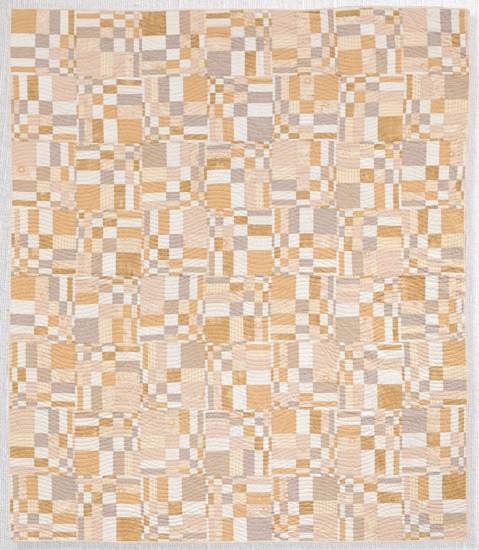 The simple echo waves of the quilting add to the curving illusion. I LOVELOVELOVE this quilt!! The whole reason I bought the book! Not one to copy quilts “exactly” (color scheme etc…) but may just have to for my first one… I am already envisioning SEVERAL. Don’t know if this would be a good “quilt along” kind of project, but I had thoughts of that as well. this is a stunning quilt. I had to keep looking at it and looking at it. The wavy quilting really does add to the circular feeling. I really like this quilt! The illusion of curves is fascinating. While I think it looks lovely in neutrals, I also think it would be fantastic in brights on white.